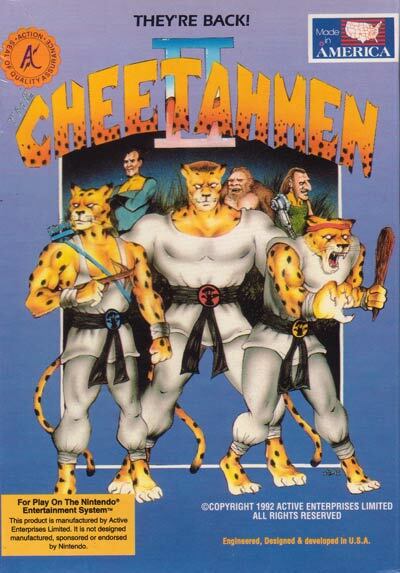 Cheetahmen II is infamous for being one of the most sought-after NES rarities, despite being unplayable due to a glitch. The game was never actually released onto the market, although it did have a small production run of physical cartridges and packaging. It was produced hastily, apparently without a proper debugging process before it was rushed into production. 1500 physical cartridges and packaging were produced, but Active Enterprises went out of business before the game could make it to market. The story goes that they ended up sitting in a warehouse until 1996 when the whole lot was eventually rediscovered and sold for $1 apiece to a single buyer. The original Cheetamen game appeared on another infamous Active Enterprises cartridge called "Action 52" which contained 52 (mostly terrible) games.